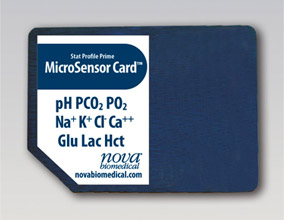 Stat Profile Prime combines the revolutionary microelectronics of the consumer world with Nova Biomedical’s innovative MicroSensor Card™ technology for a smaller, faster, more powerful yet simpler and less expensive analyzer. Stat Profile Prime’s unique cartridge system consists of individual cartridges for sensors, calibrators, and liquid quality control (QC). Individual cartridges offer a significant benefit in analyzer uptime compared to combined sensor/calibrator cartridge systems. 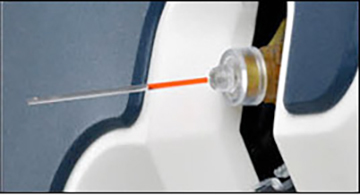 Each cartridge is ready to use and easily replaced in seconds. Cartridge RFID technology automatically captures cartridge installation time, date, lot number, test parameters, and usage. There is significant savings in analyzer uptime when replacing only a calibrator cartridge, which has no warm-up time, compared to a two-to-four-hour wait for combined cartridge systems. Individual cartridges offer a low-cost alternative compared to the inflexibility and waste of combined cartridge systems. 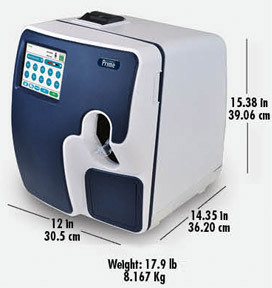 For example, an analyzer used in a high volume setting will require fewer sensor cartridges than calibrators, but a low volume setting will require the reverse. In both cases, costs are reduced by using Stat Profile Prime’s individual sensor and calibrator cartridges, which have no waste compared to combined cartridge systems. All Stat Profile Prime tests use proven Nova biosensor technology in a miniaturized, sensor card format. MicroSensor cards are automatically calibrated and always ready for immediate analysis. 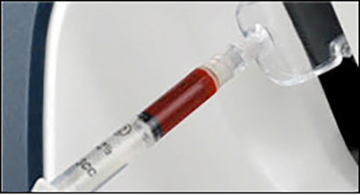 The unique Clot Block™ sample flow path is designed to protect sensor cartridges from blood clot blockages. MicroSensor cards can be replaced, warmed, and calibrated in less than half the time of other cartridge systems, which take more than an hour to calibrate and can remain unstable with drift, frequent re-calibrations, and reduced throughput for even longer periods of time. In the U.S., federal government regulations (CLIA) are phasing out electronic QC and are requiring true, liquid-based QC. 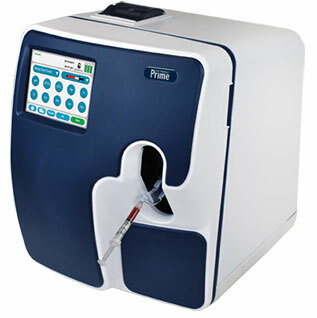 Stat Profile Prime combines both automated, true liquid QC and continuous electronic self-monitoring to ensure lab accuracy and uncompromised quality. 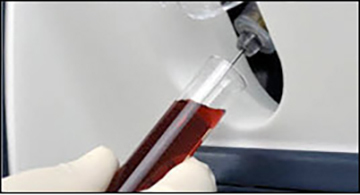 QC cartridges contain a 30-day supply of liquid QC material. Controls are run automatically at user-selected intervals. 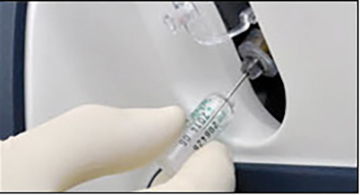 An optional QC lockout feature disables any analyte that is not within QC limits. Stat Profile Prime’s automated QC system complies with all new CLIA requirements.1 Liquid quality controls follow the identical sample pathway as the blood sample and confirm the entire analytical process for each analyte at multiple levels of concentration. QC statistics are automatically maintained. 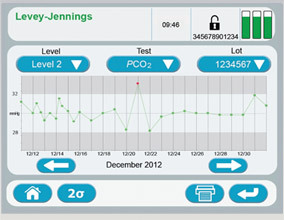 Running QC manually is one of the most time consuming aspects of critical care testing. Stat Profile Prime’s automated, true liquid QC saves hours of time each week, eliminating the need to develop, implement, and document a lengthy, risk-based quality assessment and individualized QC plan. Stat Profile Prime provides a supplement to liquid QC by continuously monitoring the status and performance of all analytical components (including sensors, reagents, calibrations, sample integrity, software, and electronics) providing real-time, sample-to-sample assurance of correct performance. Stat Profile Prime's bidirectional software uploads patient and QC results to hospital and laboratory information systems using ASTM or POCT1-A2 formats. The bidirectional interface also enables downloading of test orders, patient identifiers, and patient demographics from the LIS or HIS to Stat Profile Prime. Complete, accurate test records are seamlessly captured for the medical record. Also included is comprehensive cybersecurity protection and encryption that protects PHI and provides an added level of protection against for attempts to access a hospital's network. QC proficiency ampules can be sampled without adapters. The 1D/2D barcode scanner, conveniently located within the sample port allows for fast, error-free entry of operator and patient IDs. The optional, wireless, external barcode scanner also allows for positive patient ID, further eliminating pre-analytical error. Stat Profile Prime’s microelectronics and cartridge system result in one of the smallest and lightest critical care analyzers. Stat Profile Prime is so compact it can be located virtually anywhere in the hospital or operated on a mobile cart with a battery back-up.